Best ever train party favors! I’m just going to put it out there… I think these are the cutest train party favors ever! I’ve had these printable favor circles in my shop for a little now, and you could put them on lots of things – favor bags, train whistles, or lollipops, perhaps. But once I spotted these clear train candy boxes from Tin Toy Arcade, I knew they were THE MOST PERFECT thing that could ever go with these favor tags! Look how sweet they are! To go with the theme colors, I filled the box with red and blue M&M’s (and enjoyed eating the non-matching colors). ; ) In case you’re wondering, yes – it snaps shut and holds tight! Then, I tied on a favor circle with some red twine that I had on-hand. There’s a tiny plastic loop built right into the train box that’s just what you need to add the tag. And that’s it! That’s all it takes to make these little guys! They are really just the cutest little favors! 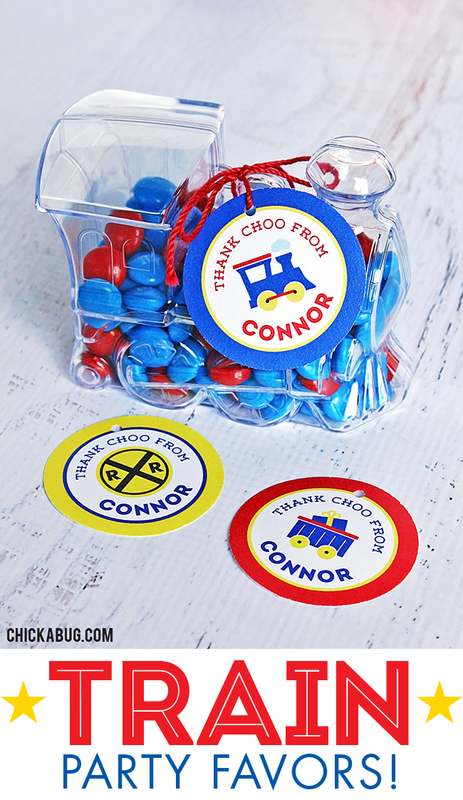 Your shopping list to make these train party favors: Clear train candy boxes from Tin Toy Arcade, printable favor circles from Chickabug, twine, and red and blue M&M’s (or other candy of your choice!). Shop for personalized Train Theme party paper goods and printables here. Or, check out more Train Theme party ideas on Pinterest or here on my blog!